When you feel a little peckish throughout the day, often you will find yourself subconsciously heading to the fridge, hoping to find something tasty to snack on. If you are not thinking carefully, your subconscious brain will likely lead you to something extremely delicious but disastrously unhealthy. Although this is not a problem all the time, regularly doing this can lead to weight gain and added health problems such as heart disease, liver disease, heart attacks, and strokes. This is due to the high level of salt, sugar, and fats that tend to be in unhealthy snacks like chips and candy bars. Eating fruit is a great way to snack throughout the day as it helps to build fiber in the body, which keeps you feeling full throughout the day. Where a high-fiber bar overloads you with all the fiber you need in one day in the moment you eat it, snacking on fruit throughout the day will slowly build that fiber level, keeping you sustainably full. 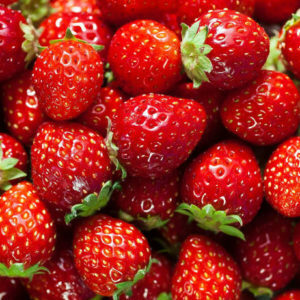 While strawberries may appear to be very sweet, unlike grapes, strawberries have relatively low sugar for fruit, with a cup of strawberries containing only 50 calories. However, they are a great source of fiber, with a cup weighing in at 3 grams of fiber. An excellent source of vitamin C, strawberries are great for boosting the immune system, preventing illness. They also have high levels of ellagic acid, which has been shown to have anti-carcinogenic properties. Watermelon is one of the absolute best fruits for weight loss. Its high water content flushes the body through, while it has a surprisingly high level of vitamin C, and is only 30 calories (an average slice). Watermelon contains a high level of the amino acid ‘arginine’ which helps to burn fat. This is a lovely snack to keep you full, help burn fat, and keep you very hydrated. Apples are an excellent on-the-go snack that only contain around 50 calories per apple. 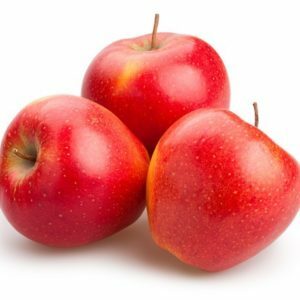 Apples have been shown to protect against certain cancers, specifically pancreatic cancer, while also lowering cholesterol and reducing the risk of diabetes. Apples are also great for the digestive system, helping to reduce constipation and reduce the symptoms of Irritable Bowel Syndrome. Blueberries are a wonder food due to their high level of antioxidants, which helps to ward off cancer. They are low in calories, but they are extremely high in nutrients. One cup of blueberries provides 4 grams of fiber, 24% of the daily recommended allowance of vitamin C and 36% of the daily recommended amount of vitamin K. They help with the heart, repair DNA damage, lower blood pressure, and improve cognitive functioning. If you fancy something a little more savory, why not grab the avocado. High in potassium, good fats (that promote weight loss), and vitamins, avocados have been dubbed a superfood. The fats contained in avocados are extremely good for heart health, helping to lower cholesterol. They are also packed full of fiber (around 7 grams per 100 gram serving), which helps you to stay fuller for longer. If you are a daytime snacker and you find yourself guiltily fridge picking, trying filling your fruit bowl with these wonders. Combined with a supplement such as ‘Ultimate Man once a day’, you will be packing in the vitamins and getting yourself as healthy as you can on a daily basis. Just be aware eating a piece of fruit will keep your fuller than a smoothie!